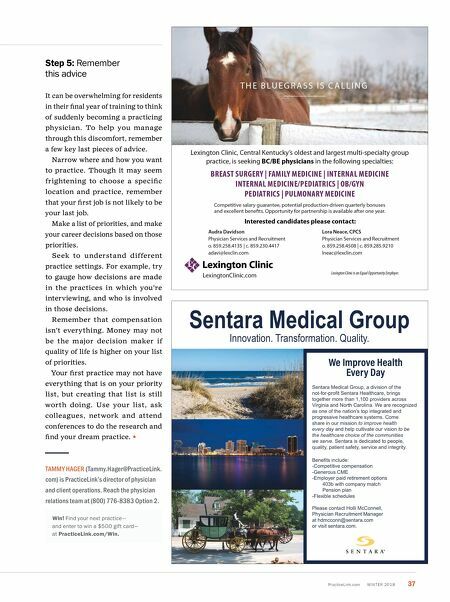 PracticeLink.com W INTER 2018 37 Sentara Medical Group Innovation. Transformation. Quality. We Improve Health Every Day Sentara Medical Group, a division of the not-for-profit Sentara Healthcare, brings together more than 1,100 providers across Virginia and North Carolina. We are recognized as one of the nation's top integrated and progressive healthcare systems. Come share in our mission to improve health every day and help cultivate our vision to be the healthcare choice of the communities we serve. Sentara is dedicated to people, quality, patient safety, service and integrity. Benefits include: -Competitive compensation -Generous CME -Employer paid retirement options 403b with company match Pension plan -Flexible schedules Please contact Holli McConnell, Physician Recruitment Manager at hdmcconn@sentara.com or visit sentara.com. Step 5: Remember this advice It can be overwhelming for residents in their final year of training to think of suddenly becoming a practicing physician. To help you manage through this discomfort, remember a few key last pieces of advice. Narrow where and how you want to practice. Though it may seem frightening to choose a specific location and practice, remember that your first job is not likely to be your last job. Make a list of priorities, and make your career decisions based on those priorities. Seek to understand different practice settings. For example, try to gauge how decisions are made in the practices in which you're interviewing, and who is involved in those decisions. Remember that compensation isn't everything. Money may not be the major decision maker if quality of life is higher on your list of priorities. Your first practice may not have everything that is on your priority list, but creating that list is still worth doing. 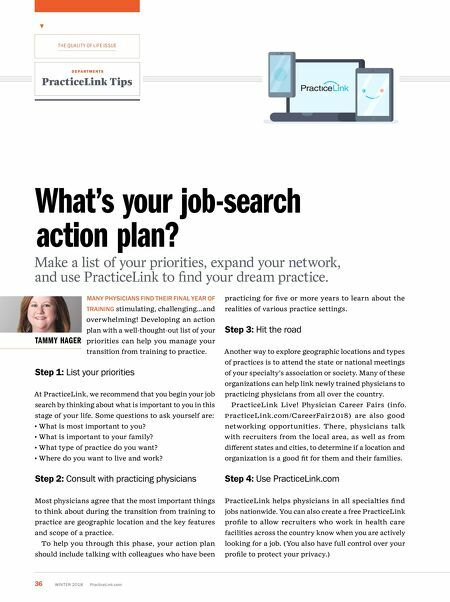 Use your list, ask colleagues, network and attend conferences to do the research and find your dream practice. TAMMY HAGER ( Tammy.Hager@PracticeLink. com) is PracticeLink's director of physician and client operations. Reach the physician relations team at (800) 776-8383 Option 2. Win! Find your next practice— and enter to win a $500 gift card— at PracticeLink.com/Win.